BUT...the important thing to remember here is that I did use IT! I do have to admit I liked the feature of being able to hide contour and then copy the image and the contour still be hidden. I chose to go with some cuts from the Cricut Lite cartridge Lovely Floral. While I am not sure I like the papers I do like the concept *okie thinks she says that way too much*. The paper I used is Stampin Up!, except the polka dot and that is some scrap I had. On this close up picture you can see where I did use a hot fix gem for the eye of the bird and you can also see the doodling I did to the images. I am hoping that one day I can feel about my Gypsy that so many others feel about theirs. But for right now....I still LOVE my Design Studio! Way to go Okie!! But, I'm with you - I have started to use my Gypsy more, but I do have trouble seeing the images even with the "zoom" capability. BUT I DO LOVE THAT I DON'T HAVE TO GO FIND THE CART!!! I still use my DS more often and I also use SCAL2 -- and I don't use the Cricut as often as I should! But I'm like you - I'm getting there! LOL! BTW - I forgot - I love the card and your sewing is fantastic! Adorable card and YEAH on using your Gypsy. Love your card. It is very cute. I need to work with my Gypsy more...I didn't know you could hide contour? Did it always do that??? Love this card, all the details make it so special! I'm with you, love DS trying to use Gypsy more, the copy and paste with contour is great, I can't seem to get the copy and paste to work on DS with grouping!!! Can you? Hi Okie! Adorable card my friend! Don't hear from you much anymore, I guess everyone is so busy doing their thing, lol. I thought I would say a quick hello. Okie, congrats on using your Gypsy (although I'm sorry it made you sick in the car)!!! You did a great job! But your card is to cute and I love your paprs, they look great!! 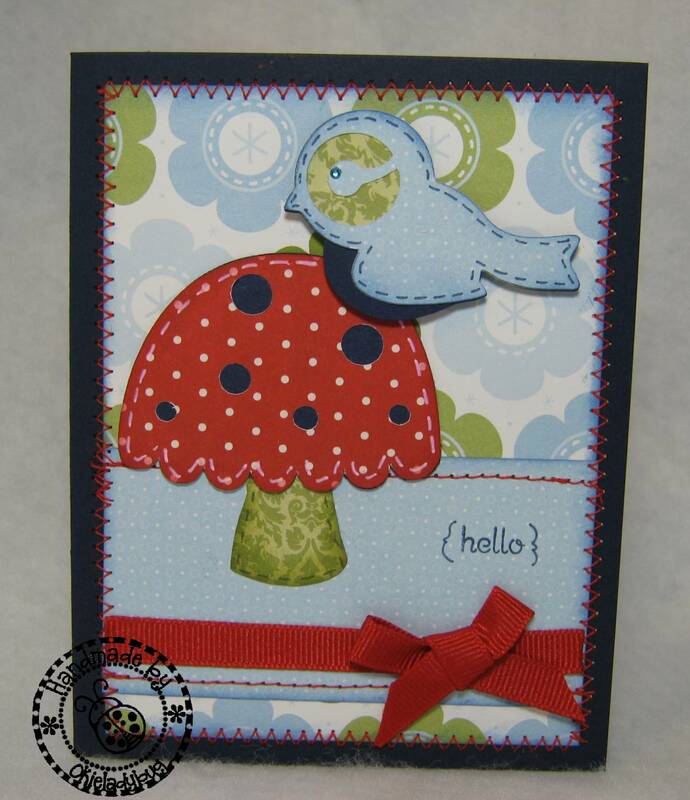 Cute card, love the little bird and mushroom! I don't have DS but do have the gypsy. I like the gypsy but I do understand it takes some getting used to. Wish there was a bigger monitor and now that I have the Imagine, it makes me wish the gypsy was in color too. Glad to see you using it more! TFS!! I love using my Gypsy. Your card turned out wonderful. I love your stitching. Nice card! And the card? SIMPLY ADORABLE! 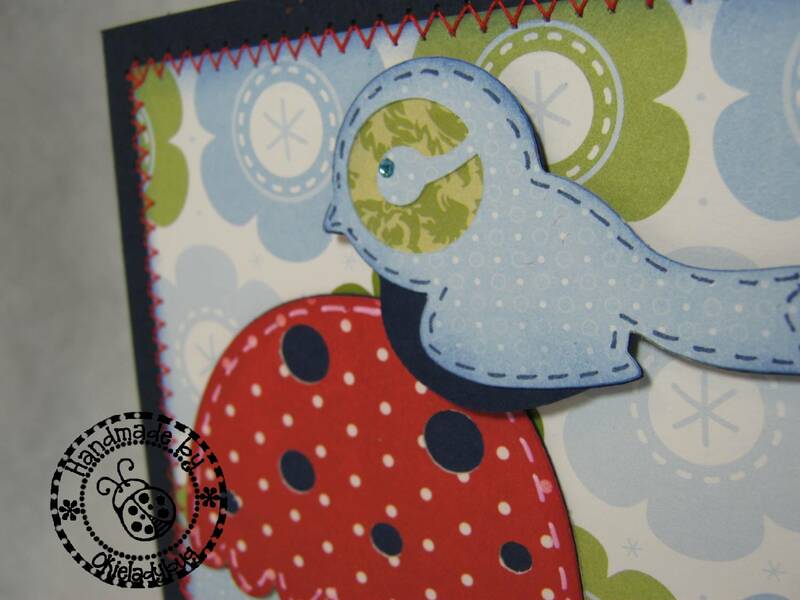 That is such a cute card, and the little blue bird is adorable! I love my Design Studio too! Also love your card. TFS! yayyy! congrats! I loove the gypsy, your card is adorable!! Card Kits aren't too bad! Promarkers....I think I'm in love!! HOT DOG! It's another layout! I Swarmed with some Cricuteers! Who doesn't love a good Maxine! Oh what a wonderful day yesterday! OH BELLE! A gal after my own heart! Would you like your own set of Cri-Kits? ?